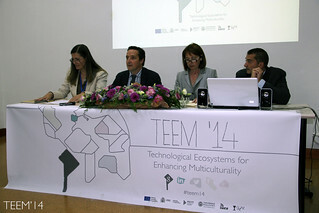 For paper presentation at the Conference and publication in the Proceedings, one registration per paper is required. Postgraduate students must provide proof of their status with a copy of their student card sent with the registration form. Please, take care to choose the proper fee regarding the additional papers. Participation is not guaranteed until full payment of the registration fee is received. Please follow the following steps for attendance registration for TEEM’18 Conference. These steps are mandatory to complete the registration. STEP 1: Begin the registration clicking on the following link. 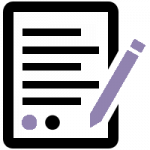 A similar screen to the following figure will appear. STEP 2: Choose the proper fee. Please, take care to choose the proper fee regarding the additional papers.This is the moment to pay for it. Remember that it is mandatory. If you choose the reduced fee for students, you must to justify your student status through sending your student car or your student enrolment official document to the formacionpermanente@usal.es email, attaching also the receipt of the payment. 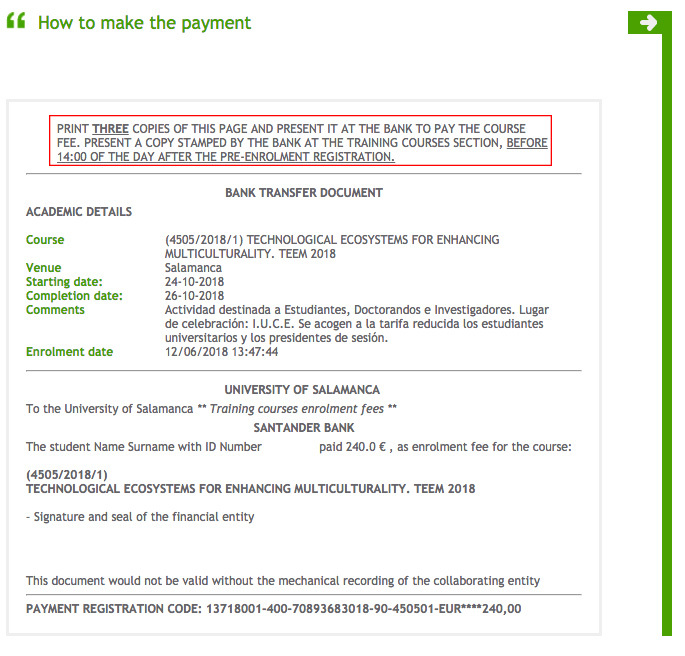 If you choose ordinary fee you only need to send a copy of the payment receipt to formacionpermanente@usal.es. 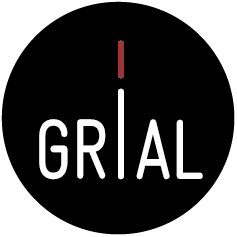 Both available fees will show you the detailed instructions for each type of payment method. 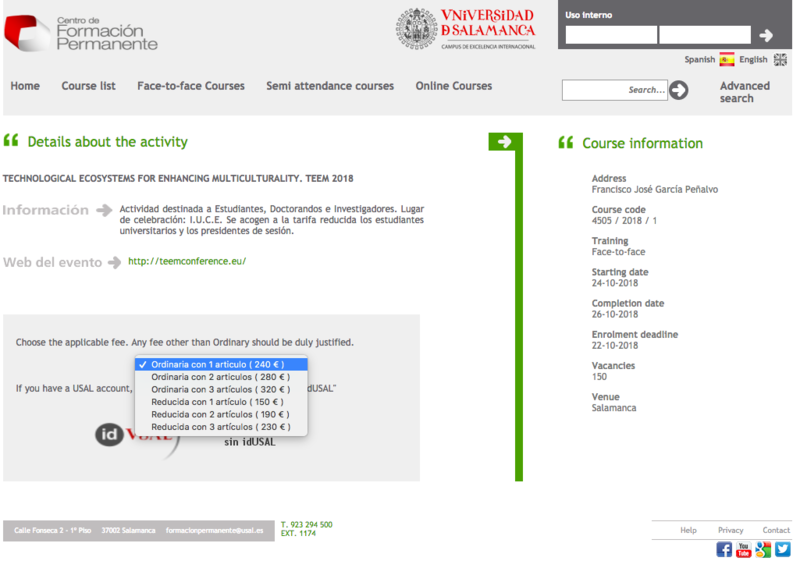 STEP 3: Choose “Inscripción sin idUSAL” if you are NOT student/employee of the University of Salamanca. STEP 4: Complete the registration form with the mandatory data (Spanish ID number for Spanish and Passport number for no Spanish) and select the payment method option that fits for you. We recommend you paying using a credit card (Pago con tarjeta), because it is easier for you and the payment will be completed instantly (using a bank transfer payment method will delay the payment completion some days). STEP 5: Follow carefully the instructions for each type of payment methods. a) If you choose the credit card payment method (Pago con tarjeta): Click on the button “pagar” (pay) and follow the instructions of the secure payment gateway. Remember to send a copy of the receipt to formacionpermanente@usal.es (or your student card or your student enrolment official document in the case of student reduced fee plus the receipt to the same email). 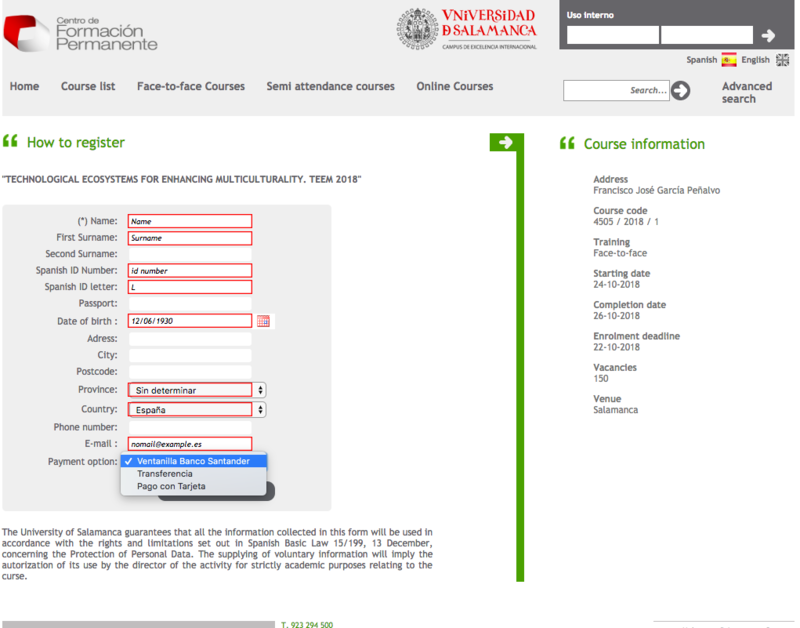 b) If you choose bank transfer (“Transferencia”): Pay attention to the instructions in the red box. 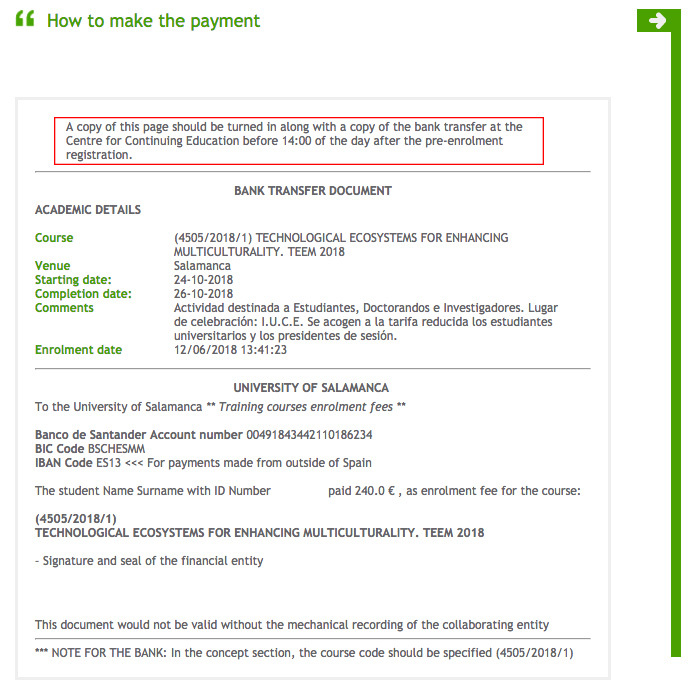 A copy of this page (a screenshot, typically) should be send to the Centre for Continuing Education (formacionpermanente@usal.es) along with a copy of the bank transfer before 14:00 of the day after the pre-enrolment registration. 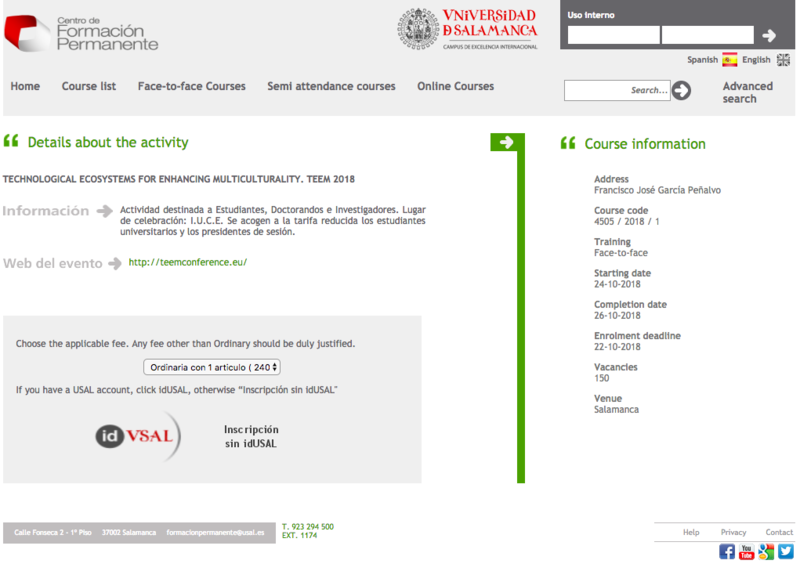 If you choose the reduced fee remember to send your student card or your student enrolment official document to formacionpermanente@usal.es in order to validate your registration. Print three copies of this webpage to make the payment at the bank. 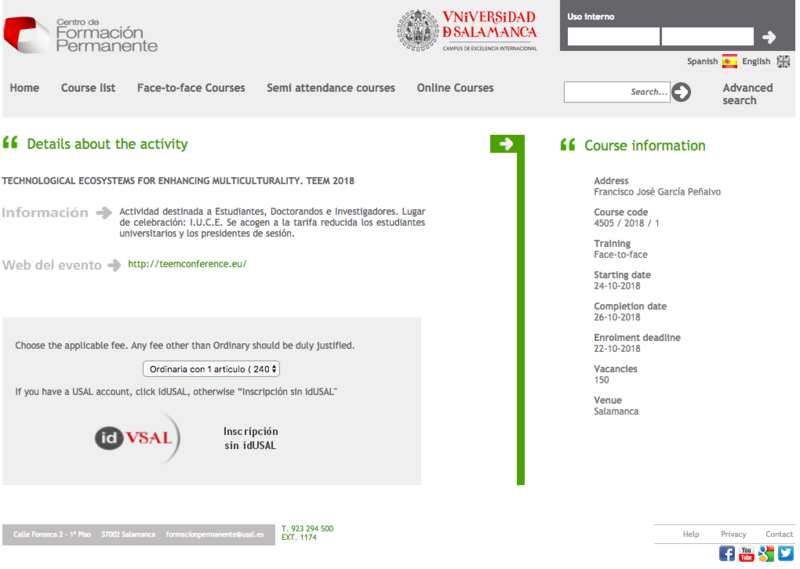 You must send a copy stamped by the bank at the Training Course section (formacionpermanente@usal.es) of the University of Salamanca before 14:00 of the day after the pre-enrolment registration. 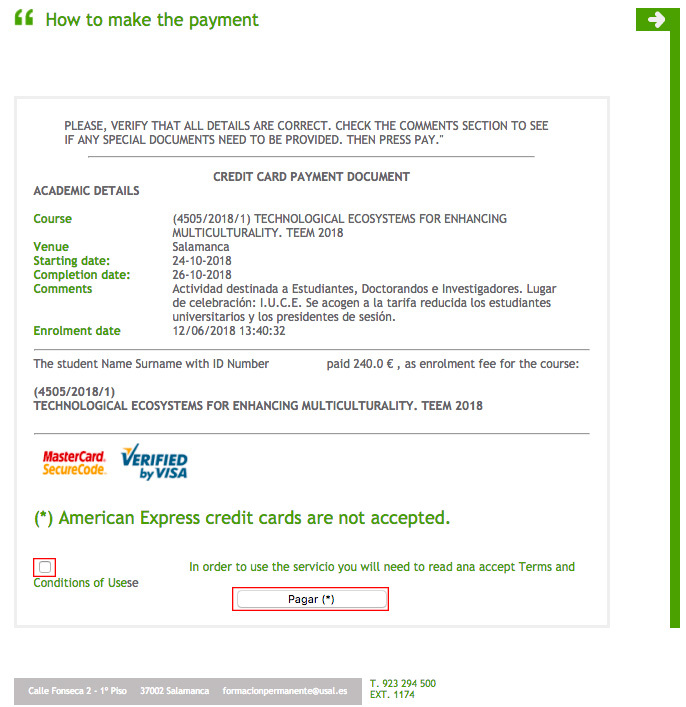 STEP 6: When the payment is done, if you need an invoice fill the following form.